Click here for a calendar of our events and races! Join us for this not-to-be-missed 8 or 18 mile trail race along the Wolf River. The after party is delicious, and the awards are always one of a kind. If you have done this race before, you are probably already signed up, and if you haven’t, you can’t imagine what you are missing! Mark your calendar for October 26, 2019 for the adventure! A ladies only shopping experience. Enjoy shopping, a wine-tasting, chair massages, a photo booth, giveaways and so much more. Subscribe to our newsletter or follow us on facebook to be in the know about the next event. Join us for Free Yoga For Runners in the store! Lisa Warmuth of Collierville Yoga leads athletes in a yoga class once or twice per month on Sundays at 5:15pm. Check out our Facebook or event calendar for dates. Once per month from March – October, we’ll venture to a different local bar for a 3-mile fun run and an after-party back at the pub. The series is FREE and everyone is welcome! Follow us on Facebook to be in the loop about the date and location of each run. Our certified coach will teach your children the basics of running and fitness during the first full week of June. The camp will end with a 1-mile graduation fun run on Saturday. Registration and more information here. Join us at 6pm every Monday for a fun run! The course follows a beautiful corridor through East Memphis that begins at the store, continues through the neighborhood, loops the perimeter of Galloway golf course, and returns along the same course forming a keyhole loop. At 6:00 pm, one of our staff members will kick off the run, and most folks will maintain a pace between 8 and 11 minutes per mile. During the warmer months, we will have water available at the corner of Gwynne and Goodlett. Many of the runners will cool off at the store for post-run water, beer, cookies or popsicles. On Thursday evenings, our staff leads speed or hill workouts from the store. If you are interested in running a little faster or mastering the hills a little easier, this is for you. It may be speed work at the track or tempo runs through the neighborhood — the course and workout changes weekly. Plan to arrive at the store at 6pm every Thursday for the workouts. You can also join the Thursday Night Run Club group on Facebook to see the weekly workout schedule. All paces are welcome! 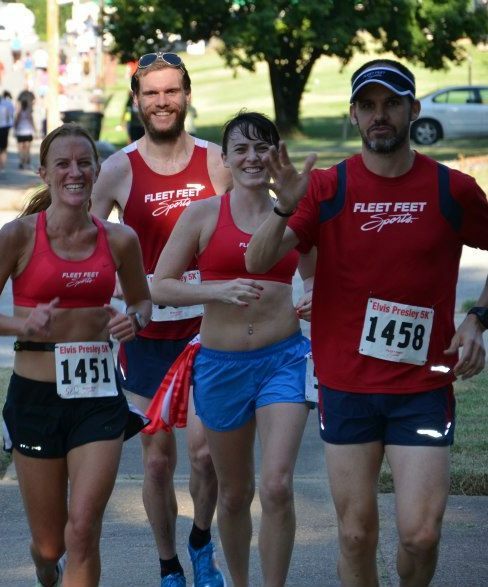 No matter your current pace, Thursday night Fleet Feet workouts will help release your inner speed demon. If you’re coming from work—don’t worry! Feel free to use our fitting rooms to change clothes. For more information, please call the store during business hours or email us: lovetorun@fleetfeetmemphis.com.